Born in Swansea, Huw Williams is Director of Music at Bath Abbey, where he directs its renowned professional choirs of boys, girls and men. A conductor and award-winning organist of international standing, he served until recently as Director of Music at Her Majesty’s Chapel Royal, St James’ Palace, where his predecessors included Thomas Tallis, William Byrd and Henry Purcell. Whilst at the Chapel Royal he conducted the music for Prince George’s Christening, the Queen’s Christmas Message in 2015, the annual Remembrance Sunday Service at the Cenotaph, and numerous other events in the presence of Her Majesty the Queen and members of the Royal Family. A graduate of the Royal Academy of Music and former Organ Scholar of Christ’s College, Cambridge, his musical achievements led to him being awarded the Queen’s Diamond Jubilee Medal in 2012. He is Music Director of Cantemus Chamber Choir, widely regarded as one of Wales’ finest choirs, and of Stroud Choral Society, and an ABRSM examiner. 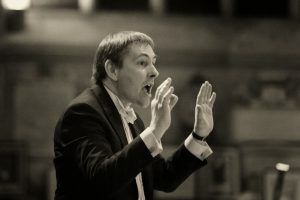 Huw’s recent conducting highlights include well-received performances of Bach’s B minor mass, St Matthew Passion, and St John Passion, Walton’s Belshazzar’s Feast, Handel’s Messiah, Requiems by Verdi, Brahms and Mozart, Mozart’s Great Mass in C Minor, Rachmaninov’s All Night Vigil, Rossini’s Petite Messe Solennelle, Elgar’s The Dream of Gerontius, Haydn’s The Creation, Mendelssohn’s Elijah and Britten’s St Nicolas, as well as new commissions by John Rutter and Giles Swayne. He recently conducted the first ever performance of the St John Passion translated into Welsh, in collaboration with Elin Manahan Thomas. Huw has directed at numerous music festivals, including those at Windsor, St David’s Cathedral, Tintern Abbey Music, the Incorporated Association of Organists and chor.com in Dortmund, Germany, as well as giving masterclasses and adjudicating at Welsh Eisteddfodau. He has directed joint events with the choirs at the Chapel Royal of Hampton Court and St George’s Chapel, Windsor as well as directing the music at the Royal Maundy at Sheffield, Blackburn and Windsor. Choirs under his direction have appeared on BBC One’s prime-time The One Show, BBC Radio 3 In Tune, Choral Evensong and BBC Radio 4 Sunday Worship, and he has also conducted choirs on tours to Belgium, The Netherlands and Germany. In 2015 he directed two acclaimed CD recordings of Christmas music; “Nativity” with Cantemus on the Regent label, and “Adeste Fideles” with the Choir of the Chapel Royal on the Signum label. Both discs have received extensive airplay on national radio. Huw has made over 20 recordings as accompanist with The Sixteen and with St Paul’s and Hereford Cathedral Choirs. He has performed with a number of leading British orchestras including the London Symphony, Royal Philharmonic, Philharmonia, Orchestra of the Age of Enlightenment, the BBC National Orchestra of Wales, the London Mozart Players, and the City of London Sinfonia. In 2017 he directed the world premiere of the “Pelicantata” – a new commission based on Roald Dahl’s “The Giraffe, The Pelly and Me”, with Stroud Choral Society and the then newly formed "Minpins", SCS children's choir. In 2018, for the third consecutive year, he will be returned to the Netherlands to direct the Willis Chorale in Leiden. This year also saw a new recording of Celtic-inspired choral music with Cantemus on the Regent record label. Alongside his conducting work, Huw enjoys an international career as an organ recitalist and accompanist. Recent highlights include the opening concert on the new Mander Organ presented to The Queen by the City of London, the opening concert on the restored Henry Willis organ at the Hooglandsekerk in Leiden, plus recitals at Lagos Cathedral, Nigeria. He was principal organist at St Paul’s Cathedral for ten years, where he played for numerous high-profile and state occasions, notably the Queen’s Golden Jubilee Service in 2002 and the Queen Mother’s 100th birthday celebration. During his time at St Paul’s he was awarded the Associate of the Royal Academy of Music and made two solo organ recordings, one of which, “Organ Spectacular” received the Gramophone Editor’s Choice award. A fluent Welsh speaker, Huw was also the subject of a 2004 documentary on S4C, and many of his compositions have been performed at St Paul’s Cathedral, Buckingham Palace and further afield.